We have already discussed the Kat Von D Alchemist Holographic Palette on my blog, if you need a catch up click here to read that post, and now let's talk about how the Alchemist Palette compares with the Moonchild Glow Kit. 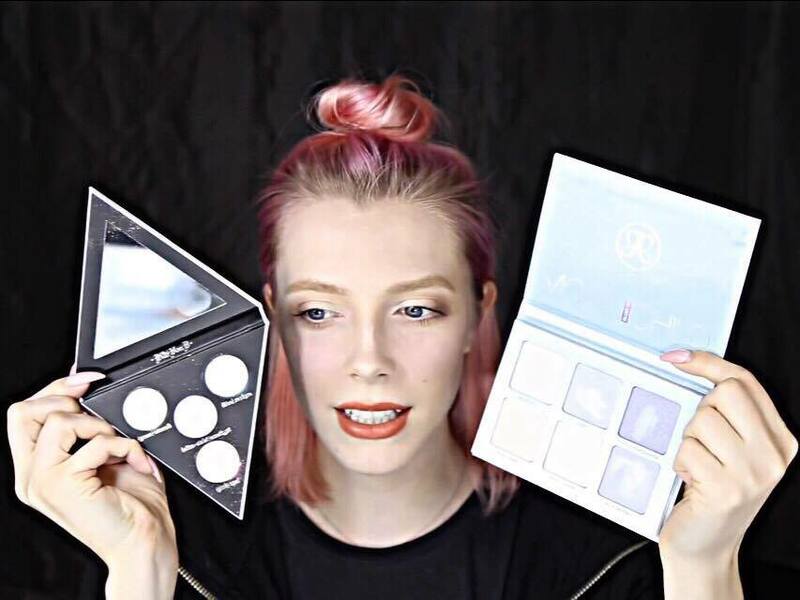 I don't want to beat around the bush because the lovely Leigh Dickson did a video comparing the two palettes with swatches and she did a fantastic and fair job. Please watch it below and continue reading for annotated swatches and my thoughts on both palettes. PACKAGING: Although both made out of cardboard, the Alchemist packaging is much nicer in my opinion, it is clear a lot of thought and detail went into it. From the swirling design to the triangular shape it is blatant Kat wanted this product to stand out on the shelves and she created a very beautiful palette. 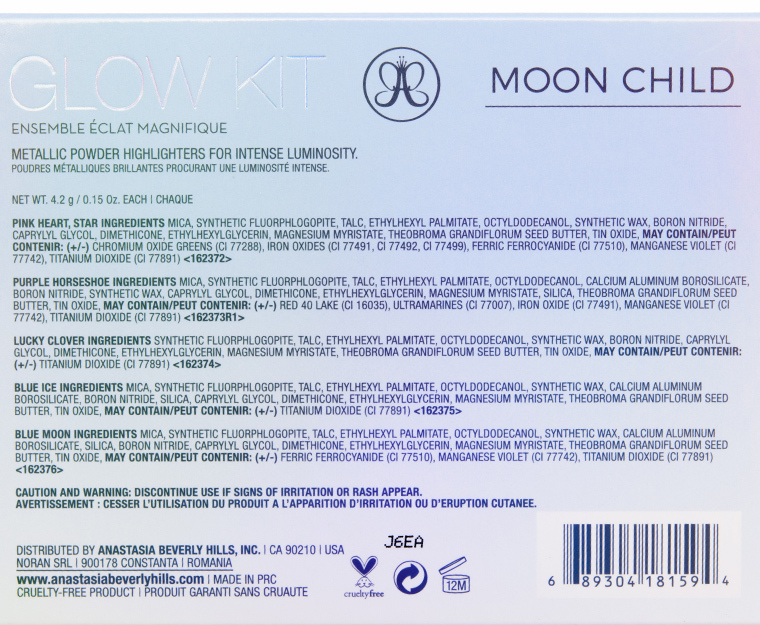 The Moonchild Glow Kit is still nice, I really like the bluish silver colour of the palette but other than that it looks quite plain with the standard logo and lettering and no mirror inside. SIZE: Anastasia Beverly Hills Moonchild Palette wins this hands down. PRICE: Alchemist Palette retails for $32 to Mooonchild's $40. 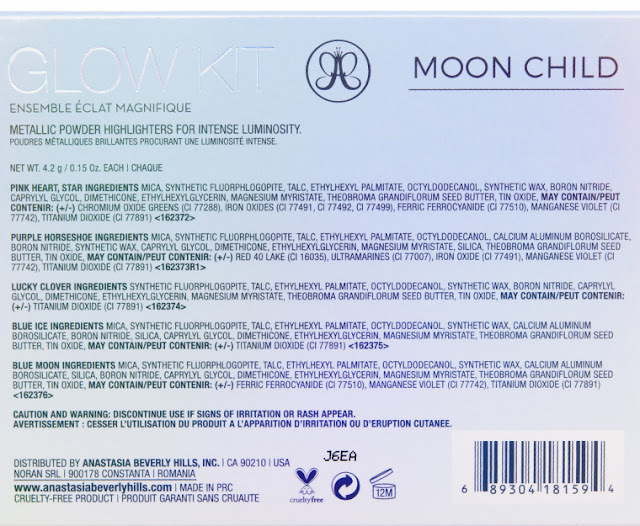 VALUE FOR MONEY: Moonchild wins this one hands down too, not only do you get two extra shades in this palette but in total almost 25g of product compared to Kat Von D (4 x 1.53g). QUALITY: Both palettes contain high quality formulas, creamy, blendable with very similar shades. 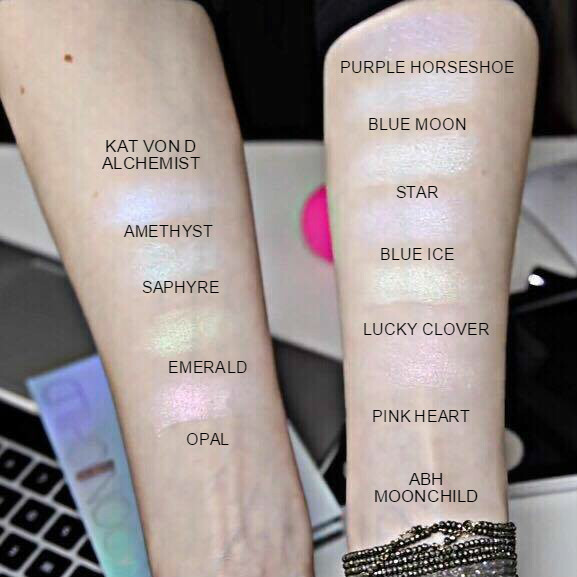 The only difference I can detect is the colour payoff for the Alchemist palette is much stronger right off the bat, to build the same intensity with the Moonchild shades you would have to layer applications. ETHICS: Both palettes are cruelty free and vegan. Moonchid, however, is made in China as you can see from the photo below it reads "Made in PRC". That's China, photo taken from temptalia.com. I can't seem to find where the Alchemist Palette is made, once I know I will add the information. VERDICT: I would buy the Anastasia Beverly Hills Moonchild Palette because although the shades aren't as pigmented this does render them more wearable. The shades can easily be built up to reach a similar effect of the Kat Von D palette and it is better value for money hands down. Which do you prefer: Moonchild or Alchemist? 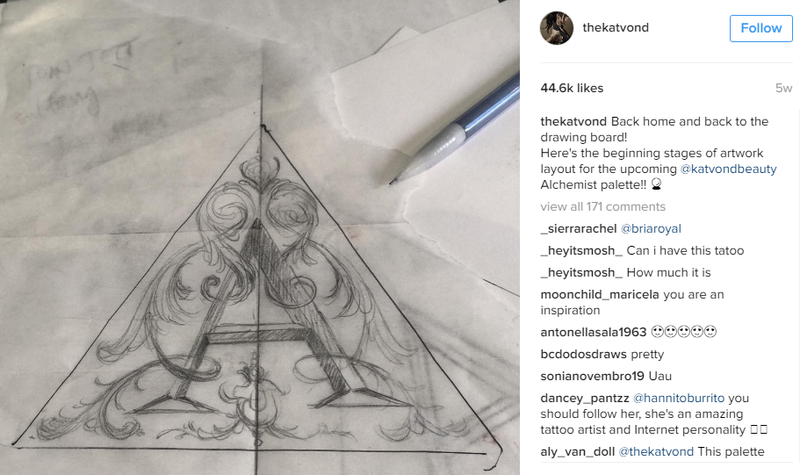 I actually don't really like the look of Kat Von D's packaging but definitely appreciate how quality her formulas are. I am a loyalist to ABH though so I'd have to say the Moonchild palette wins as well. really informative review but i still think i'd like to try them both. you can never have too many highlighters in your life!